Cambridge United beat Woking to put Luton Town's promotion celebrations on hold at least until the weekend. The U's can still mathematically close the 13-point gap on the Conference Premier leaders with five games left. Luke Chadwick's clever dummy allowed Delano Sam-Yorke to put Cambridge in front, before Chadwick finished from a Richard Tait pass. Woking mounted pressure but failed to work U's keeper Will Norris, and Liam Hughes's 20-yard strike sealed the win. The U's need just two more points to guarantee their place in the play-offs. Luton can cement their return to the Football League after a five-year exile if they beat Braintree on Saturday. Match ends, Woking 0, Cambridge United 3. Second Half ends, Woking 0, Cambridge United 3. Kevin Betsy (Woking) is shown the yellow card for dissent. Foul by Scott Rendell (Woking). Tom Champion (Cambridge United) wins a free kick. Goal! Woking 0, Cambridge United 3. 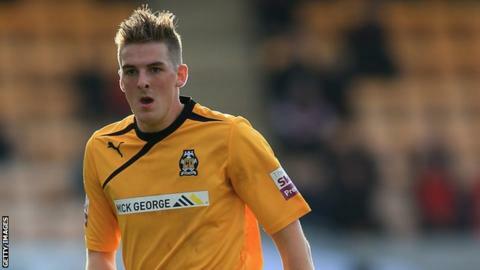 Liam Hughes (Cambridge United) left footed shot from outside the box to the top left corner. Attempt saved. Ashley Chambers (Cambridge United) right footed shot from the left side of the box is saved. Attempt missed. Joey Jones (Woking) right footed shot from outside the box is too high. Liam Hughes (Cambridge United) wins a free kick. Offside, Cambridge United. Ashley Chambers tries a through ball, but Ashley Chambers is caught offside. Substitution, Cambridge United. Ashley Chambers replaces Delano Sam-Yorke. Substitution, Woking. Scott Rendell replaces Jack Marriott. Substitution, Woking. Brett Johnson replaces Mark Ricketts. Offside, Cambridge United. Delano Sam-Yorke tries a through ball, but Delano Sam-Yorke is caught offside. Substitution, Cambridge United. Andy Pugh replaces Matthew Barnes-Homer. Foul by Matthew Barnes-Homer (Cambridge United). Joey Jones (Woking) wins a free kick. Foul by Adam Newton (Woking). Delano Sam-Yorke (Cambridge United) wins a free kick. Attempt missed. Ian Miller (Cambridge United) right footed shot from outside the box is too high. Matthew Barnes-Homer (Cambridge United) wins a free kick. Foul by Josh Payne (Woking). Hand ball by Liam Hughes (Cambridge United). Attempt saved. Ryan Donaldson (Cambridge United) right footed shot from outside the box is saved. Second Half begins Woking 0, Cambridge United 2. First Half ends, Woking 0, Cambridge United 2. Attempt missed. Matthew Barnes-Homer (Cambridge United) right footed shot from outside the box is too high. Attempt missed. Jack Marriott (Woking) right footed shot from outside the box is too high. Foul by John Goddard (Woking).